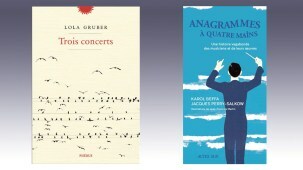 High expectations surrounded this production of Auber’s Domino Noir, premiered in February 2018 at the Opéra Royal de Wallonie, since it hadn’t been performed since the 19th century. How is it possible that the 9th most played title in the comic-opera repertoire, the result of the composer’s prolific collaboration with librettist Eugène Scribe, disappeared from every stage since? It is true that Le Domino noir presents an implausible plot and is demanding singing and speaking wise, but the music is engaging, the libretto extremely funny, the characters well defined and the settings where the three acts take place are very contrasting. The title of the opera is also fascinating, because it plays on the multiple meanings of the word « domino »: the game, a cloak used by the clergy and a long hooded cape, which prevents from noticing who hides underneath. In an attempt to avoid recognition, a young woman hides under a black « Domino » to attend the masked Christmas ball held by the Queen of Spain. Here she meets some other guests : the flaunting Count Juliano, the infuriating diplomat Lord Elford and the gentle Horace de Massarena, Secretary of the Embassy, who recognizes in her the mysterious woman who charmed him at last year’s ball. He courts her and proposes to her, but she refuses, despite herself. This is followed by a series of misunderstandings, disguises, and pitfalls that lead Horace to believe he has gone mad, while recognising his beloved in all the women crossing his path, from the beautiful masked woman to the young servant, up to the Abbess herself. But in reality she was indeed all those women she had to embody in order to conceal her true identity. We thus discover that the mysterious woman was Angela of Olivares, niece of the queen, who just wanted to profit of a last mundane night before being appointed abbess the next day. Because of an unexpected inheritance, the queen compels Angela to abandon the veil and seek a husband. Horace and Angela are thus reunited, under the joyful sound of the bells of the convent of the Annonciades. If Patrick Davin, the musical director, has revised the score with moves or inserts (from disco music to the famous Aquarium by Saint-Saëns, with the help of the sound designer Dominique Bataille) and simplified some transitions and repetitions, to make the plot more comprehensible and to « enhance the freshness of the music », the directors, at their first opera staging, humbly chose to stay as close as possible to the libretto. Valérie Lesort, stage director and visual artist, and Christian Hecq, member of the Comédie-Française, just made a few cuts in the spoken texts, while remaining in a 19th century Spain, reinterpreted in a colourful, entertaining and surprising atmosphere. To begin, each character at the masked ball wears an animal or floral costume (created by Vanessa Sannino) : Angèle is an elegant black swan, Brigitte de San Lucar is a dandelion (in a superb dress composed of a crinoline decorated with yellow feathers), Lord Elfort is a porcupine whose thorns rise up when he gets angry (thanks to a mechanism hidden in his costume), Count Juliano is a peacock with a tail opening as a fan, and Horace wears on his hat a lawn with blue butterflies. With the plot taking place in three completely different locations (and atmospheres), the stage directors were able to give free rein to their creativity by focusing on humour and surprise. In the first act, we have a game of transparencies with a large clock with multiple functions: on the one hand, it separates the calm and discreet ambiance of a boudoir from the noisy and turbulent ballroom, on the other it reminds our Cinderella (the first libretto of the opera was called New Cinderella) that she has to leave the ball at midnight. 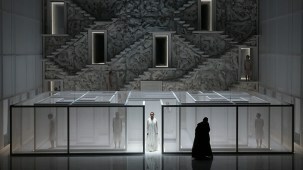 In the interior scene of the second act, we find several doors allowing the characters to appear or to flee, to hide or to disguise themselves, in an amusing succession of misunderstandings. Some tables on wheels, spinning around the poor Inesille/Angèle, in the grip of a group of men – whose jesting and libidinous side is perfectly conveyed by the members of the Accentus choir. The final act takes place in the convent chapel, adorned with statues and gargoyles, a ray of sunlight illuminating the floor, filtered by stained glass windows invisible to the public. Christian Pinaud’s lights, at once intimate, flamboyant, warm and solemn, contribute to the effectiveness of these atmospheres, as do the dancers (Anna Beghelli, Sandrine Chapuis, Margaux Dufour, Mikaël Fau, Gaëtan Lhirondelle et Guillaume Rabain),, who dynamise the narrative with great energy. We also remark the animated puppets by Valérie Resort and Carole Allemand, who manage to surprise us several times during the evening. Anne-Catherine Gillet‘s Angèle (who wad a superb Minerva in Le retour d’Ulysse dans sa patrie)) is a convincing heroine, dramatically » chameleonic » and musically flawless, with her fluid and very agile voice, which contrasts with the wider timbre of Antoinette Dennefeld, who is a convincing Brigitte de San Lucar. Cyrille Dubois is a nice and moving Horace de Massarena, perfectly mastering his voice, full of tenderness, in singing and spoken voice, as the opera-comic genre demands and Laurent Montel offers us an exhilarating Lord Elfort with a very pronounced English accent. Marie Lenormand (Jacinthe), transformed by her costume/puppet of overweight woman, plays perfectly the game of the busy housekeeper who, having to reschedule her romantic evening with Gil Perez, the rude convent guardian (realistically played by Laurent Kubla), considers going to work for « an old bachelor », who won’t give her extra work and who, above all, may one day leave her an inheritance. Sylvia Bergé, also a member of the Comédie Française, ensures a pretentious and ironic Ursula, who claims to become Abbess instead of Angèle who « commands no one and lets everyone speak », and who finally manages to do so. With the sound of the bells in our heads, activated by acrobatic and dancing nuns, we leave the salle Favart uplifted and amused, with the desire to be back soon, in order to discover another hidden jewel.